By a happy accident at a Prontoprint facility, Steve Bage’s 17” span MIG17 was printed as ‘A3 fit to page’ and a 27” version was borne. 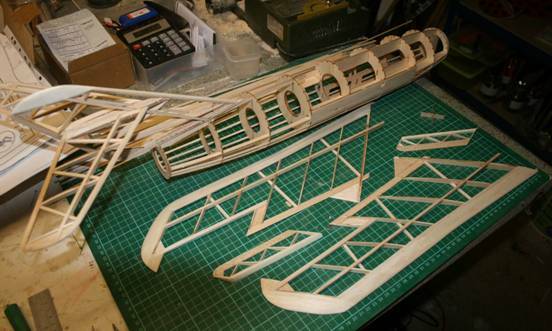 I had not before contemplated a scale model but the excellence of the design impressed and I succumbed to the challenge of producing a free flight electric EDF scale jet, having never before been tempted by the ‘scale’ discipline. 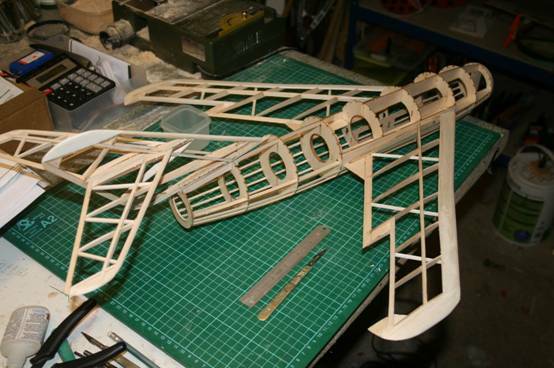 The complexity of the design prompted me to engage Belair to laser cut 4 off kits for the Peterborough MFC as I was doubtful of my ability to produce the plethora of intricate formers and wing ribs that Steve’s design requires. 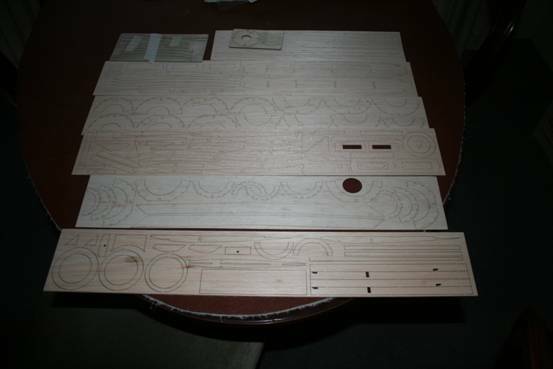 Steve was happy to supply a 143% .dxf file that Belair needed to laser cut the kits. This was a good decision as the quality of the cutting was first class. However, the components require some adjustment as the jigging slots were designed for the smaller 17” model. This is not a build for the faint hearted and will require some modification of the Belair supplied components. As supplied the Belair hardware appear as ……..
Sticking bits together result in…. The plan calls for cutting the fuselage in half at the F7 junction to get access to the EDF. I was nervous about doing this , so I cut the fore and aft dorsal K1A member to achieve the same. Having witnessed the state of a colleagues paper inlet and outlet ducts in damp weather, I am not going to use paper. I have ordered some clear acrylic from sales@clearplasticsupplies.co.uk to act as formers and I intend to plagiarise the gummed brown paper technique to build the ducting, described in the Free Flight Forum papers 2011. This can be damproofed using Johnsons Klear. The parts assemble easily bearing in mind that the jig slots were oversize having used sheet thickness as per the 17” original. The method of wing retention is unique and esoteric, needs careful fitting but works well. I did however CA in a couple of magnets at the root rib. These figures are outrageous and I knocked out a test rig to see what the unit was really capable of. I used an E30 kpaero controller with a ‘wait to start’ feature achieved with a push button to the right of the controller. The suppliers figures are generous but not that far off. Assuming 1.8 gm/Watt of thrust a 2 cell pack will give 149gm thrust. (Pay not too much attention to static thrust figures, a decent forward speed works wonders as does good inlet and outlet ducting. At model sizes its not a science but an art). A Hyperion G3 2 cell 550 mah is 65 x 18 x 15mm and will fit nicely within the battery bay and weigh 32gm for 13.7 amps (25C). The 2 cell might be underpowered but nevertheless it’s the one I am going for. 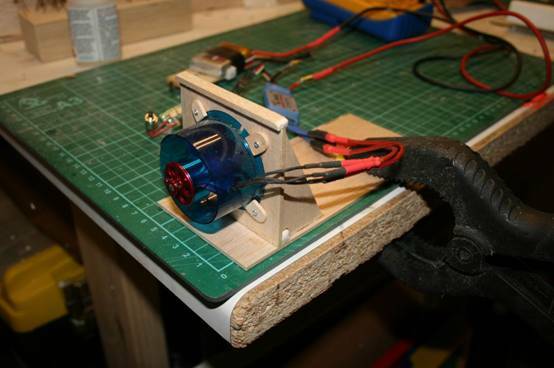 I will team this with a 19gm basic Robotbirds ESC capable of 25amps continuous. This recognises I might be wrong on the required thrust allowing a 3s battery change to get out of trouble. 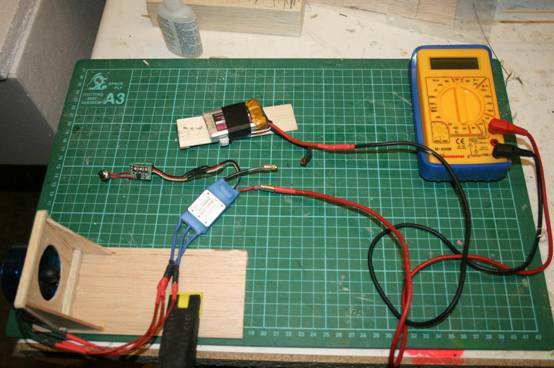 For a 2s battery I could fit a 12amp ESC and lose 6gm………not worth the effort. Going 3 cell will be overkill and will add 37 gm to the AUW, probably destroy the balance and put the AUW to 222gm. Try the 2s , it might be OK.
Look out for Chapter 2 when I have made the ducting and installed the power unit.